An excellent opportunity to purchase an attractive stone built property in a prime location in the centre of the town. For sale as a whole lot, this substantial property has potential for split use for offices or living accommodation. The property is single glazed with sash and case windows on the first floor and timber framed windows on the ground floor. This property has undergone major renovations which included re-roofing, re-painting and new carpets laid on both floors. Laid out on two floors are the large ground floor sales area and the first floor, which is split between storerooms and office areas. There is a further attic store and basement area. The total sales area is approx 89m2, stores and office area approx 84.5m2 and the cellars approx. 55m2. Tain is a Royal Burgh and post town in the committee area of Ross and Cromarty, in the Highlands. The town has several attractions such as Tain Tolbooth and St Duthus Collegiate Church and also boasts a local history museum, Tain Through Time, and the Glenmorangie Distillery. 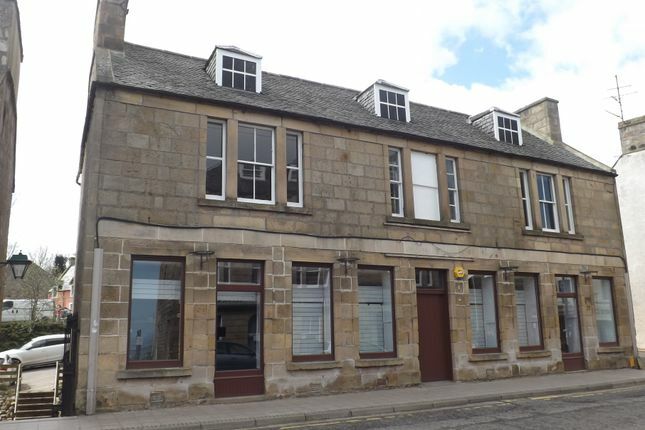 The High Street in Tain is steps away, where the professional, medical and banking services can be found. The town has all four major banks, a new medical practice, Lidl, Co-op, Tesco, Asda, a variety of local shops and hotels, two primary schools and a secondary school. A number of recreational pursuits can be enjoyed in the area such as golf, bowls and tennis. The Highland capital, Inverness is 34 miles to the south where all major transport links can be found. A commuter train and bus service goes from Tain to Inverness daily. Property descriptions and related information displayed on this page, with the exclusion of Running Costs data, are marketing materials provided by Georgesons, and do not constitute property particulars. Please contact Georgesons for full details and further information. The Running Costs data displayed on this page are provided by PrimeLocation to give an indication of potential running costs based on various data sources. PrimeLocation does not warrant or accept any responsibility for the accuracy or completeness of the property descriptions, related information or Running Costs data provided here.